In Scandinavia they do things differently to the UK. There, it is usual for homes to be manufactured in factories as pre-constructed panels and assembled quickly on site. Over half of the new homes there are built this way and it’s perfectly normal to have a house roofed and watertight in a week. The whole turnkey project can be completed in ten to twelve weeks, minimising the time you need to spend in a caravan or temporary accommodation. In the UK around 10% of homes are self-built and the government and the National Custom and Self Build Association are keen to see this significantly increase. Right to Build plans are in place to enable more people to build their own homes each year and you could be among them. Our suppliers have over one hundred individual designs to choose from, with new ones added all the time. We offer a complete construction service so you won’t have to build it yourself. All you need is to find the plot and obtain planning; we can even provide help and advice on that too. From start to finish, your home can be completed in around 20 weeks from placing your order, which includes factory delivery time of 10-12 weeks. Scandinavian houses are typically made from sustainably forested timber frames and are designed to be warm and energy efficient. Using renewable technologies, including solar panels and heat pumps it is possible to achieve a high level energy performance certificate of A or B. 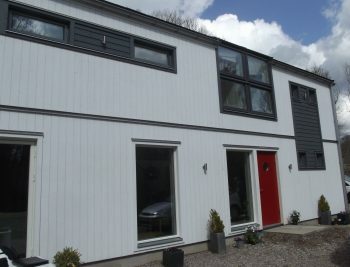 Of course no-one expects a modern home to be draughty but Scandinavian homes have had strict air tightness requirements for far longer than we have the UK. This means our houses are completely draughtproof and typically achieve air permeability of better than 2.0m3/hr/m2. By use of a warm air heat exchanger, minimum energy is wasted and home comfort can be maintained whilst ensuring a constant supply of fresh air. As is the norm, all the homes have highly efficient triple glazed windows and doors with U values of 0.9 and 1.0 W/m2K respectively. Our suppliers have been making homes for over 40 years, so you can be sure the house we build for you will be everything you wish for. Timber is a durable material, even here in the UK as can be seen by the number of timber barns, village halls and even WWII Nissen huts still in use today. Scandinavians build their houses using high quality timber grown in indigenous forests. They are designed to withstand coastal regions with high rainfall and humidity, similar to the UK, as well as inland positions where there are wide ranges in temperature. They are built to last a lifetime with minimal maintenance.